“A glorious take on Vivaldi”. 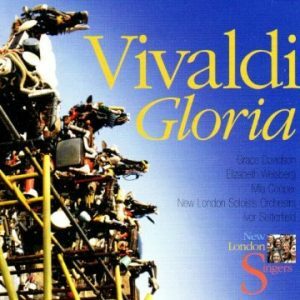 From the opening strains of Vivaldi Gloria, you know you’re on to a winner. Recorded by the New London Singers in a concert at All Hallows Church, Gospel Oak, in May this year – sponsored by the New Journal – this is a polished, professional and thoroughly enjoyable collection of some of Vivaldi’s best-known choral works. The broad acoustics of All Hallows lend a generous amount of reverb to these ‘sacred’ works, preserving the sense of listening to a live recording – something that’s all too often lost in the dull and sterile atmosphere of a studio. Of course, when the source material is this good, you can’t really go wrong – but that’s not to take away from the performance. Soloists Grace Davidson and Elizabeth Weisberg are pitch-perfect and gloriously clear in their delivery, while Ivor Setterfield leads the chorus to a tight, disciplined accompaniment. The New London Soloists Orchestra also distinguish themselves, with beautiful playing throughout. In short, this is as good as anything you’ll find on the catalogues of EMI or Naxos. And with the enthusiasm that’s etched into every line of this recording, and Ivor’s proven skill in breathing life into this often-neglected form of music, it seems that the future of choral music is safe in his and the New London Singers’ hands.